MobileWeb, provider of SMS solutions and mobile applications, moves its mobile apps division into a new entity, Twipe. Since its start in 2001, MobileWeb offers solutions for SMS connectivity and mobile payments. Gradually the company started the development of mobile sites and applications for smartphones and tablets. MobileWeb’s portfolio contains apps for De Standaard on iPad, the iPhone app of Studio Brussel and 2deScherm on Android of SBS Belgium. As the app business grows fast, it requires a specific approach. .
Twipe, a combination of Touch & Swipe, specializes in mobile applications for newspapers, magazine publishers and tv-broadcasters. “With Twipe we want to offer flexible mobile publishing solutions for big media groups to bring their newspapers, magazines and media content on iPad, iPhone and Android devices. Our mobile publishing platform allows us to create in a short period of time, a unique and efficient solution in line with the customer’s needs“ says, Danny Lein, Managing Director Twipe. Twipe can already look back on an extensive set of reference cases. Recent developments include Humo, De Standaard HD, 2deScherm (SBS) and NRC Handelsblad on iPad and iPhone. The SMS services and mobile payments continue operate under the MobileWeb brand. Twipe (http://www.twipemobile.com) Twipe is a division of the E-ZONE group (http://www.e-zone.net). E-ZONE was founded in 1999 and drives interactive businesses. Twipe focuses on mobile publishing and creates innovative custom applications for media groups. Bijna 30% van alle Belgische digitale tv-klanten gebruikt video-op-aanvraag (VoD). Gemiddeld spendeert elk gezin per jaar 10 euro. Dat meldt Astel. Volgens Astel laten meer en meer Belgen zich verleiden tot VoD-diensten. De Belgen zouden in 2010 45,8 miljoen euro verbruikt hebben aan VoD. Dat is een stijging van 30% in vergelijking met het jaar daarvoor. Dat maakt van ons de op één na zwaarste VoD-gebruikers van Europa (Portugal staat op nummer 1). Belgacom was de eerste in 2005 en sindsdien is de catalogus gegroeid tot 1.500 films. Minstens een derde van alle Belgacom TV-klanten zou maandelijks minstens één keer VoD gebruiken. Bij de Waalse kabelaar VOO daarentegen kwam VoD heel wat later, in 2009. De helft van alle VOOcorder-abonnees zou maandelijks een betalende bestelling maken. Mobistar kwam heel recent pas met VoD op de markt. Volgens Astel zal ook Billi, een relatief kleine ADSL-provider in Wallonië, nog voor het jaareinde van start gaan met VoD. Billi heeft sinds vorig jaar een aanbod van digitale tv. From October 10-12, the IFRA Expo 2011 will be in Vienna, Austria. IFRA Expo is the international communication platform for the newspaper industry and its suppliers, covering the entire range of products and services for newspaper magazine production and bringing together the right people in the right atmosphere. More than 10,000 visitors from 85 countries (share of decision-makers: 90 %) attend IFRA Expo annually. With a wealth of innovations on board, this is an event you do not want to miss. We invite you to visit us at the MobileWeb booth A570-11 in hall B, just accross the Media Port. If you would like to make an appointment with a representative of MobileWeb, please contact Steven Selleslags. We’ll be in touch at the earliest opportunity. 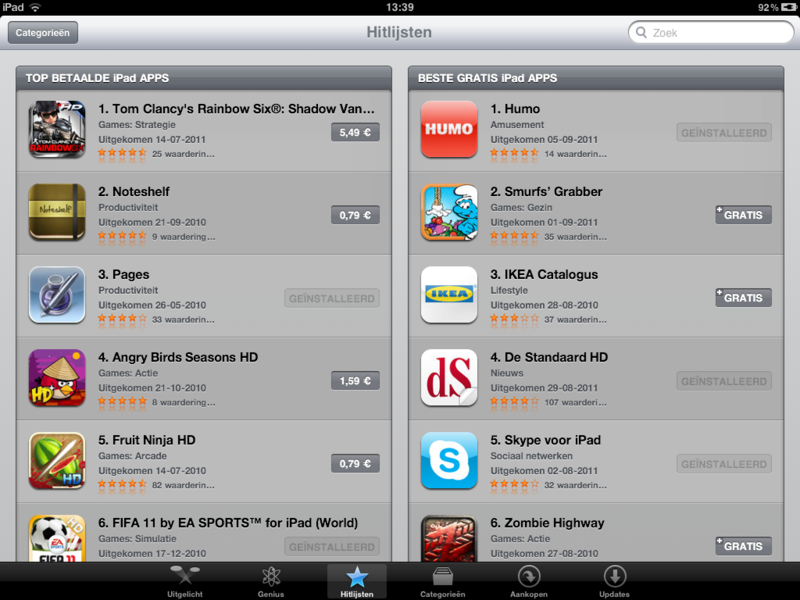 In just a few hours, Humo on iPad reached the nr 1 position of the App Store. Next to the many downloads, a lot of positive comments were shouted and tweeted around. Thanks! 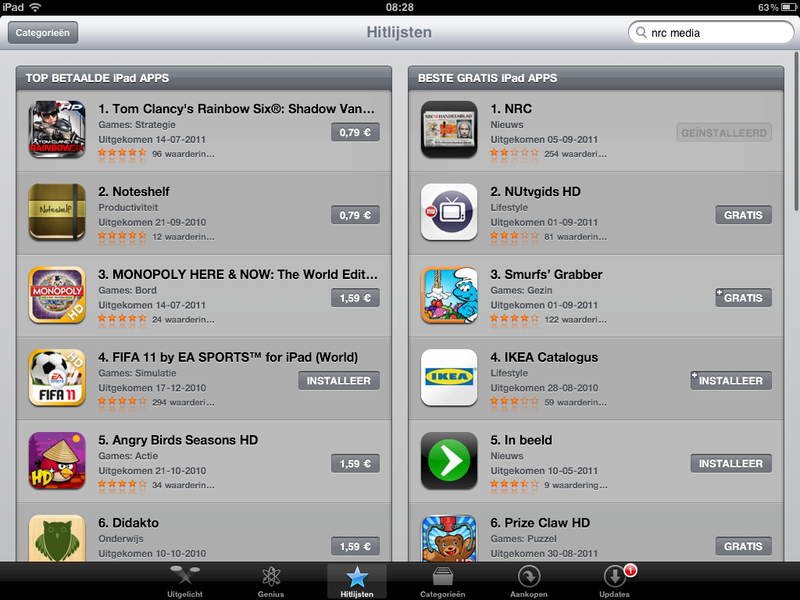 Also in the top 5 of the charts we see De Standaard HD on a steady 4th place. One day of the launch of its new application, the iPhone and iPad application of NRC Handelsblad is ranked on the first position in the Dutch App Store. Download now for free the new NRC iPad / iPhone app! The success of the NRC app has also generated a large number of downloads for the NRC “In Beeld” app, which is now ranked on the 5th position in the App Store. 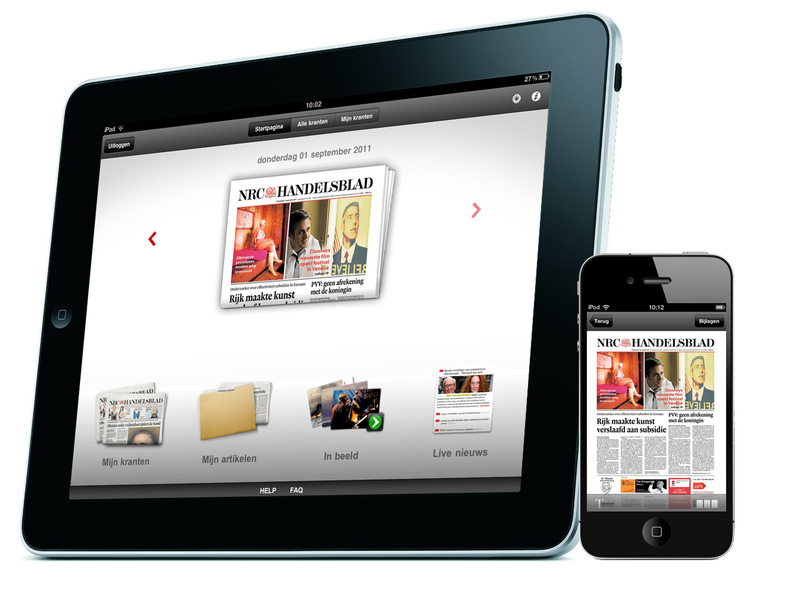 The NRC iPad and iPhone app have been developed by MobileWeb on its Mobile Publishing Platform. Today, HUMO released its long anticipated iPad app. The app was developed on the MobileWeb Mobile Publishing Platform. Download the app now for free in the App Store! After opening the app, you will land on the Media Screen containing the best of Humo’s website articles, with a focus on the TV content. All articles are brought together under topics such as TVreviews, Actua and Video. When tapping on one of them, a flipreader opens which makes it very easy to consume. Moreover, every article can be shared via facebook, twitter or email; recommended articles appear on the right side of the screen. Humo fans will also enjoy the typical content Humo stands for such as ‘Uitlaat’ and ‘Cartoons’. 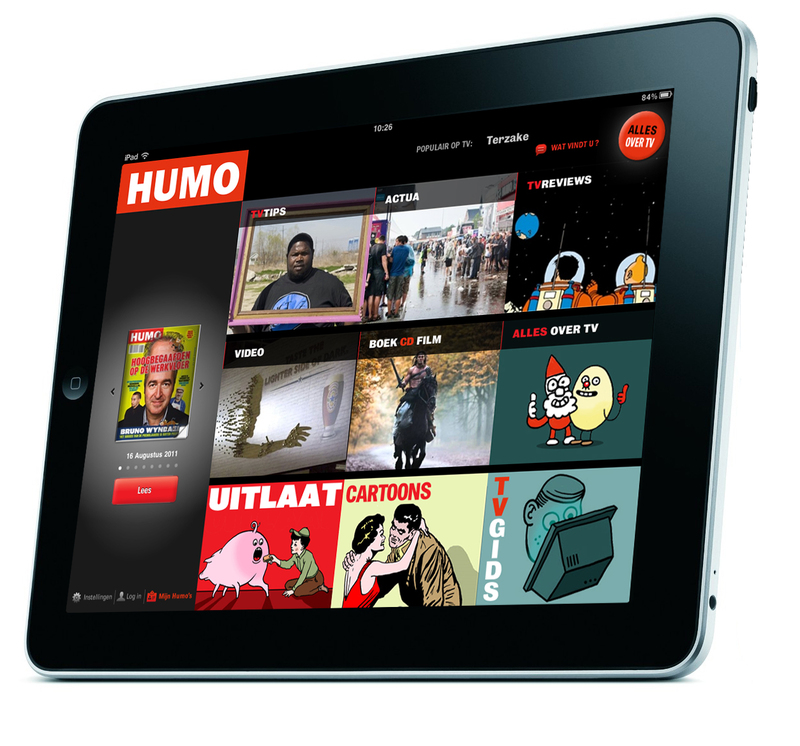 In the brand new Social TV Guide, HUMO reinvents itself on the iPad. With the Humo app at your fingertips you can discuss, comment and criticize with other peers who are watching the same programs. Also let your twitter and Facebook followers know what you are watching so that they can join you. Very original is the frameset that has been developed to browse through TV programs. Next to the TV guide you will find ‘now on TV’, ‘Popular programs’ and ‘Humo’s selection’ which enables you to discover new interesting programs. Finally, a Humo app wouldn’t be a Humo app without the Magazine. The app offers the complete magazine in a smooth high quality pdf . Subscribers of the paper magazine can download the iPad version for free, non-subscribers can buy the digital magazine for 2,39€. After launching De Standaard and NRC Handelsblad, another publisher benefits from MobileWeb’s Publishing Platform to get their content on the tablet. If you wish to receive more information about the MobileWeb Publishing Platform and services, please send a mail to contact@mobileweb.be. The Humo app available for free in the App Store as from today. Download it now!